The Fluke 96B features three modes of operation. The first is multimeter mode. This displays standard multimeter information, including voltage, amperage and resistance. Multimeter mode is often used for troubleshooting simple electronic circuits. The second available option is oscilloscope mode. 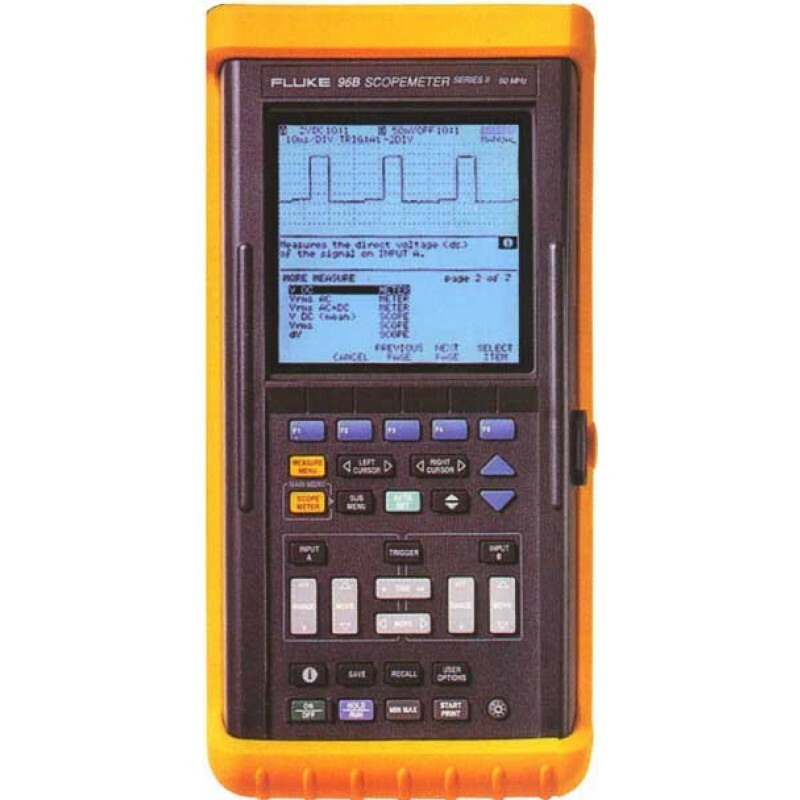 In this mode, the Fluke 96B displays a digital waveform. The digital oscilloscope mode is useful for analyzing complex digital circuits. A third mode combines the previous two modes and displays scope and multimeter functions on one screen. The Fluke 96B comes with a standard internal battery pack, which allows for portable operation. The battery pack contains nickel-cadmium (NiCAD) 4.8 volt power cells and can power the Fluke for up to four hours. The Fluke 96B can also be powered from an external source, using an 8 volt to 20 volt direct current (DC) power supply with a 5 mm plug. The Fluke 96B is designed to meet International Electrotechnical Commission (IEC) safety standards and is UL-listed for electrical measurements up to 600 volts. The device features overload protection that stops electrical flow if 300 volts or more are detected. The Fluke also has surge protection that can resist electrical spikes up to four kilovolts. The display of the Fluke 96B is a digital monochrome screen with a zoom function. This zoom allows users to quickly focus on specific details of the oscilloscope display. The Fluke 96B oscilloscope screen play is capable of displaying data at 2.5 giga-samples per second (GS/s). proper time base, input range, and trigger level. Sweep speeds 1 µs per division or slower on INPUT A.
Smoothing up to 256 waveforms. 10 samples in Roll mode. Touch Hold®, Change Alert™, Smoothing™, Continuity Beeper. Readouts in % change, % scale or delta-zero. Chart recording function to log MIN, MAX, and AVERAGE readings. Displays all 3 readings as graphs with time and date stamp. Automatic vertical scaling and horizontal time compression for recording from 120 seconds to 40 days.